If you love steaks on the barbecue, but you’re looking to cut calories and fat, give these delicious fake steaks a shot. Cauliflower has been proven to satisfy as a carb stand-in (as mashed potatoes, rice and even bread and pizza crust) and now it makes its move to a hearty grilled entrée. And did I mention, it’s super easy to make? Brush both sides of each slice of cauliflower with olive oil and season with a sprinkle of black pepper and optional salt. 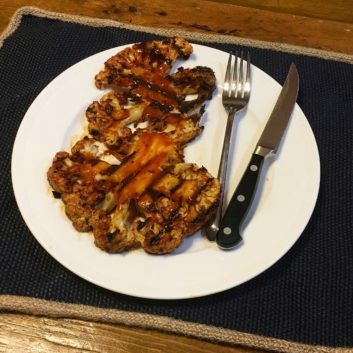 Place cauliflower slices on heated grill and cook for about 5 minutes per side.